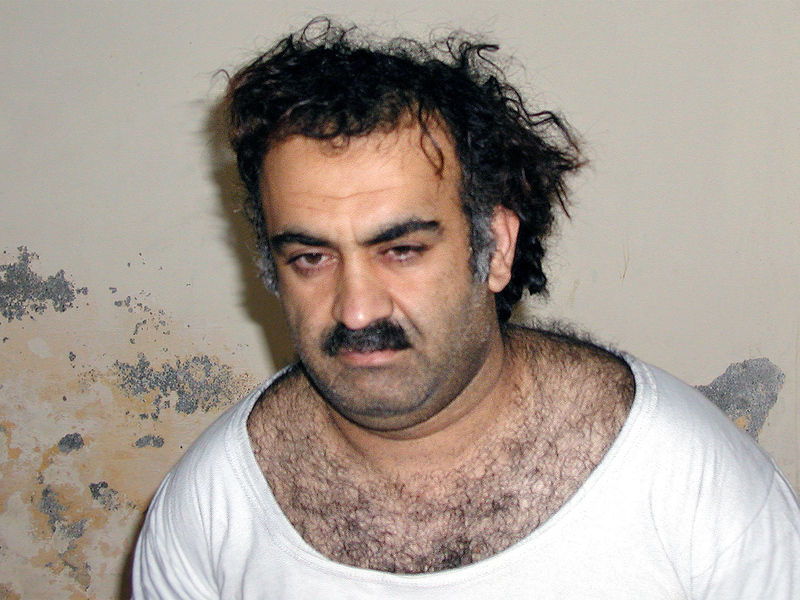 Attorney General Eric Holder today announced that self-proclaimed Sept. 11 mastermind Khalid Sheikh Mohammad and his four alleged co-conspirators will be tried in a military commission, as the CBS News Investigative Unit reported earlier today. A source tells CBS News the commission will be held at the Guantanamo Bay prison. Today's announcement represents a pronounced shift in the administration's handling of terrorism cases. Trying Mohammad in a civilian court and closing the Guantanamo prison were once some of the Obama administration's top priorities, but political realities have hamstrung both goals. Holder said today that he still believes the federal court system would have provided the best court system. The Justice Department today unsealed the indictment against the accused 9/11 plotters in December 2009, which Holder said revealed "we were prepared to bring a powerful case against Khalid Sheikh Mohammad." "I continue to think the Article 3 courts are the best place to bring" the accused terrorists to trial, he said. However, he added, justice for the victims of 9/11 has been "long overdue and must not be delayed any further." The attorney general forcefully blamed Congress for compelling the Justice Department to make this decision by interfering for political gamesmanship. Members of Congress, by using legislative tools to restrict federal terrorism trials, "have taken one of the nation's most tested counter-terrorism tools off the table and tied our hands in a way that could have serious ramifications," he said. "The prosecution of Khalid Sheikh Mohammad and his co-conspirators should never have been about settling ideological arguments or scoring political points." In November 2009, Holder announced that Mohammad and four other alleged Sept. 11 plotters would be tried in New York City, but he scrapped that plan in the wake of public consternation. Republicans and some others in Washington said the decision compromised national security, while a CBS News poll at the time showed that most Americans thought such suspects should be tried in a closed military court. Holder said on CBS' "Face the Nation" last July that he preferred trying the alleged terrorists in civilian court because the United States has an "extremely capable" court system that has proven effective in these kind of cases. "I think there's a lot of misinformation out there. We have proven an ability to hold in our federal prison system people convicted of, charged with terrorist offenses very effectively, very safely," he said. Before Holder announced his decision in 2009 to move ahead with civilian trials, both federal prosecutors and military prosecutors were ready to go forward with trials or commissions, CBS News has learned. Both teams made their case in presentations to Holder. Although Mohammad's post-capture "confessions" of dubious admissibility are the best known "evidence" against him, a law enforcement source tells CBS News that federal prosecutors had developed significant, additional evidence -- clearly admissible in federal court -- showing Mohammad's role in planning the 9/11 attacks. Furthermore, Mohammad made a complete pre-capture torture-free confession (along with Ramzi Binalshibh) in a Pakistan safe house to Al Jazeera reporter Yosri Fouda in 2002, reported at the time and recounted in his book "Masterminds of Terror." Fouda was prepared to be a government witness in either venue. Finally, there was voluminous evidence implicating the five 9/11 Gitmo defendants introduced publicly in the Zacarias Moussaoui trial in Virginia federal court five years ago. Congress in the past year has tried to undermine the administration's goal of closing Guantanamo by restricting funding for such policy changes -- for instance, a defense bill Mr. Obama signed in January blocked the use of Defense Department dollars to transfer Guantanamo suspects to U.S. soil for trial. Meanwhile, the case of Ahmed Ghailani, the first Guantanamo detainee to be tried in civilian court, last year cracked open the debate over how to bring to justice detainees in the "war on terror." Ghailani was convicted of one conspiracy charge but acquitted of more than 280 other charges related to his role in the 1998 bombings of U.S. embassies in Africa. Listen to Attorney General Eric Holder in the video at left say that the administration still intends to close the prison at Guantanamo Bay. Last month, Mr. Obama approved the resumption of military trials for detainees at the Guantanamo prison, ending a two-year ban. The move illustrated Mr. Obama's acknowledgment that he will not be able to fulfill his promise to close the prison any time soon -- Mr. Obama said on the 2008 campaign trail that he would close Guantanamo within his first year in office. Still, Mr. Obama said last month that he remained committed to trying terror suspects in federal courts. "I strongly believe that the American system of justice is a key part of our arsenal in the war against al Qaeda and its affiliates, and we will continue to draw on all aspects of our justice system - including Article III Courts - to ensure that our security and our values are strengthened," Mr. Obama said in a statement announcing the resumption of Guantanamo trials. Holder said today, "It is still our intention to close Guantanamo," though he acknowledged that the restrictions Congress has instituted on trials for Guantanamo detainees will have an impact on the time it takes to close the facility. Many Republicans today, including Sen. Jeff Sessions (R-Ala.), a senior member of the Senate Judiciary Committee, welcomed the administration's decision to try Mohammad in a military commission. However, Sessions said in a statement today that the administration remains misguided in its insistence on closing the Guantanamo prison. "The president's improvident campaign pledge to shutter GITMO was built on the naive premise that softening America's image would somehow soften our enemies' resolve," he said. "That the Administration apparently still clings to this hope--despite the continuing spate of attempted domestic terror strikes and the return of a host of detainees to the war again--suggests, at bottom, a failure to properly understand the radical Islamist threat." On CBSNews.com's Washington Unplugged, CBS News National Homeland Security Correspondent Bob Orr said today's announcement "is an embarrassment for the administration, but in the big picture, it won't change a great deal about the status about these 9/11 co-conspirators."